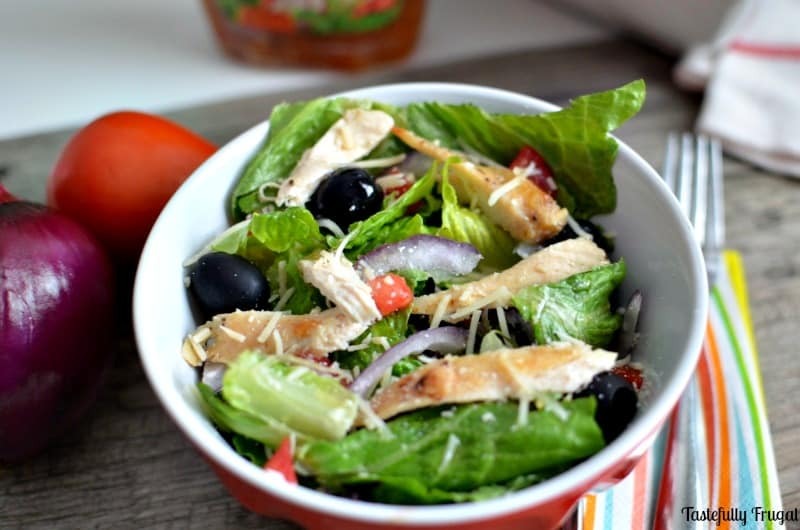 Turn your favorite Italian Restaurant’s salad into a delicious meal by adding chicken! Don’t you just love Italian food?! I’ve mentioned before that when my husband and I were dating we went out to dinner…A LOT. We had a favorite Italian restaurant we went to all the time mostly because of the salad and bread sticks. There were many a meal where I would get full on the salad before dinner even got to the table and I’d usually end up taking most of the actual dinner home. When I was thinking of ways I could mix our dinners at home up a bit that tasty salad came to mind. I knew I wanted to make my favorite salad at home but I needed to add more protein to make it a full meal and, and this was the important part, I wanted it to be quick and easy. We’ve had a lot going on lately and by the time dinner time rolls around the last thing I want to do is spend an hour in the kitchen. 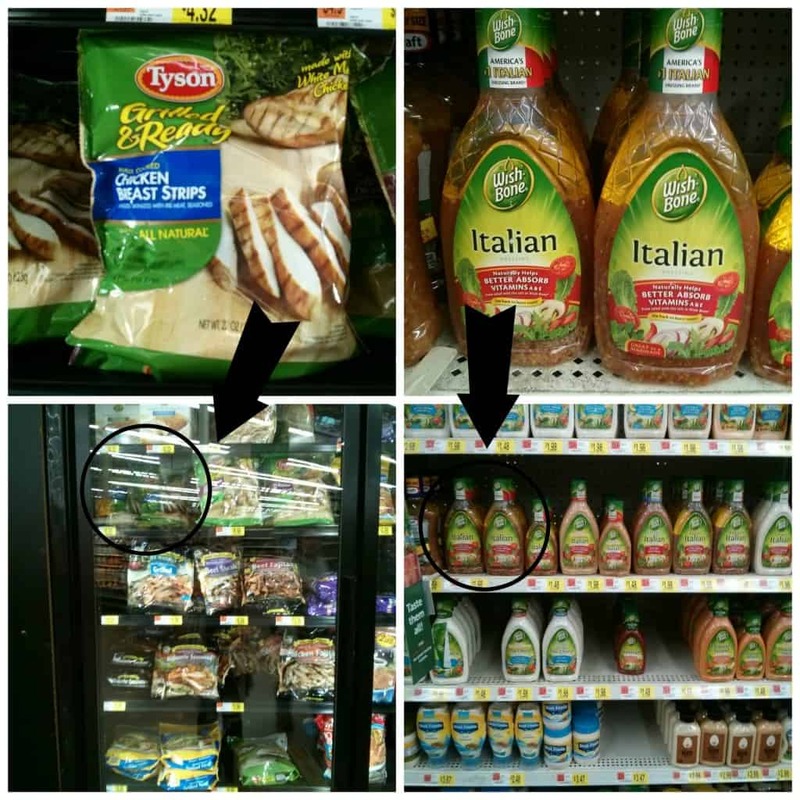 So when I was at Walmart doing our weekly grocery shopping I was excited when I found Tyson® Grilled & Ready Chicken Strips in the freezer section. They were perfect for my salad since all I had to do was heat them up in the microwave; no thawing or cooking required. 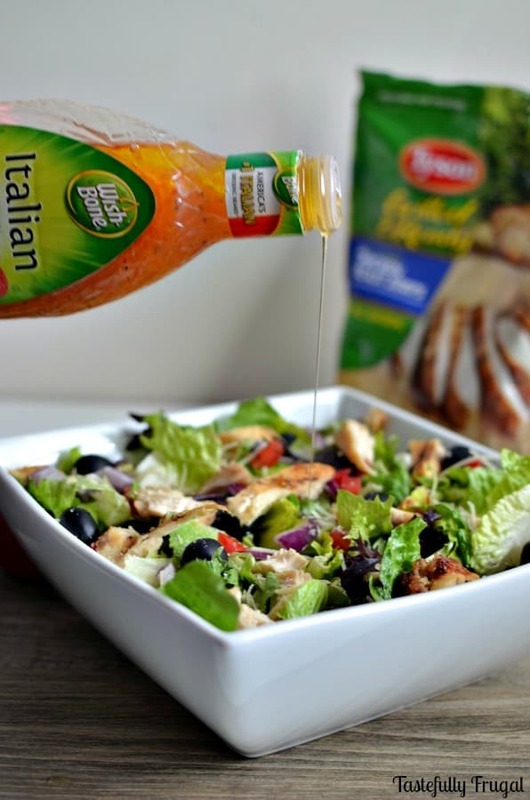 I also picked up a bottle of my favorite dressing, Wishbone® Italian, and a few other ingredients (as well as a week full of other meals) and was ready to make my salad. 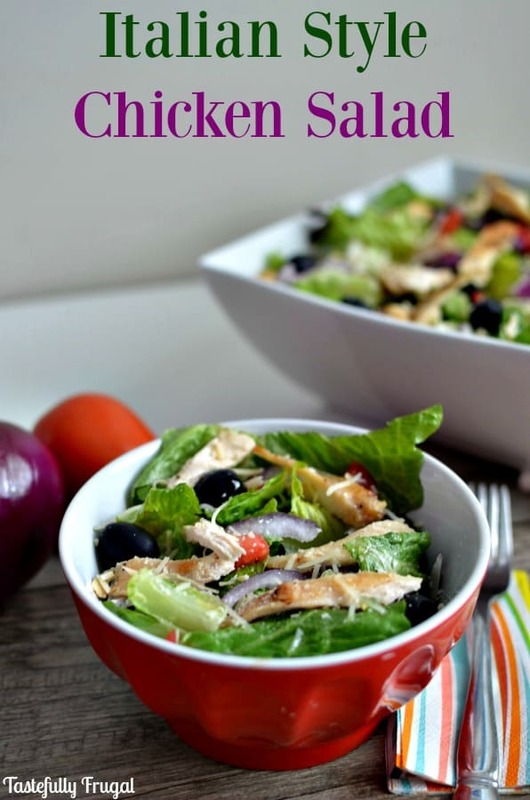 I love how easy this salad is to make and how good it tastes. It took me about five minutes to throw everything together and it was a huge hit with the whole family. My boys especially loved the chicken and black olives. I loved how much it tasted like that famous salad and how filling it was. We even had enough leftover that I was able to have salad for lunch the next few days. 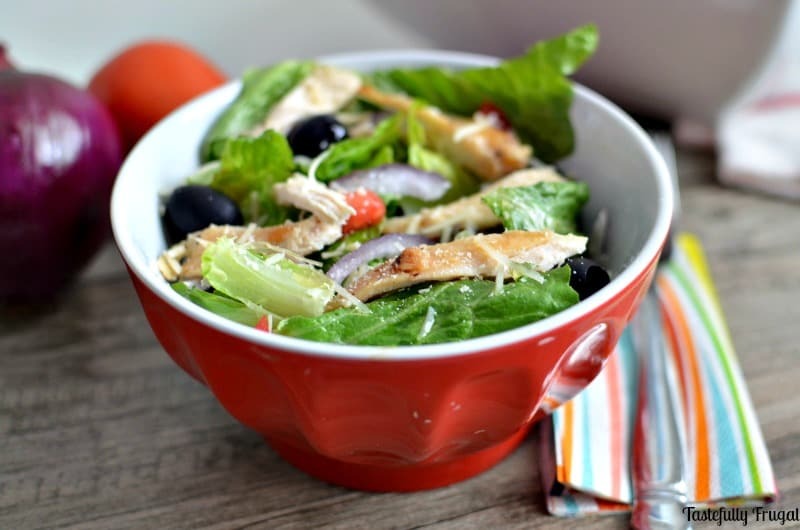 If you’re looking for a tasty, healthy dinner salad that is easy to make and that everyone will eat, give this salad a try! Prepare Tyson chicken according to package directions (I used 6 strips). Pour bag of salad mix in large bowl. Add in tomatoes, red onions and olives and chicken strips. If you think you'll have leftovers, drizzle dressing on individual servings so that you can save the rest of the salad for lunch the next day. 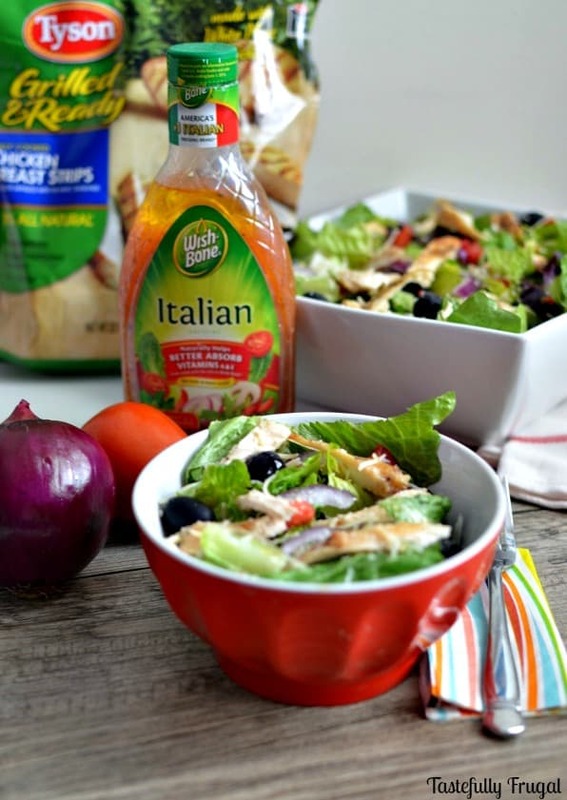 Do you like having salads for lunch or dinner or both?! Don’t miss the in store 75¢ off coupons for both Tyson® Grilled & Ready products (found on Wishbone® Italian Dressing bottles) and Wishbone® Dressing (found on Tyson® Grilled and Ready products)!